Taking quality as our principal concern, we are engaged in presenting an excellent quality of Unifloor Raised Access flooring to the prestigious customers. Reckoned as one of the foremost business names, we are engrossed in delivering a wide consignment of Raised Floor. Owing to our enriched industrial experiences, we are devoted towards trading a wide variety of excellent quality Raised Floor Panels. Decor World offers complete access raised flooring system to pacify the upcoming demands of delivering high performance, sustainable & cost effective raised floor for covering underneath wiring & underfloor service distribution. Trouble free solution for Server/ Lan wiring commercial applications. 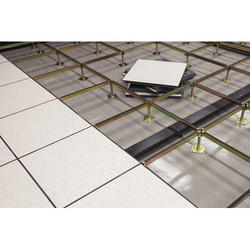 Raised flooring are used in server farm area for bottom fed precision air-cooling, segregated and concealed power and data cable management, uniform transfer of server rack loads. Widely reckoned amongst the distinguished organizations, we are dedicatedly betrothed in offering a superior quality collection of Raised False Flooring System within the specified time frame. Being a quality oriented enterprise, we are engaged in manufacturing and supplying Raised Flooring. Modular Access Floor: It is an extraordinarily versatile and flexible instrument giving designers unprecedented creative freedom. Equipment and cabling is easily housed in the plenum underneath the access floor. Accessible floor systems offer both the user and the building owner great flexibility on how the workspace can be used and reconfigured. The ability to route and re-route services, such as data and power delivers great versatility. Earcons offers the following advantages. Sealing cable openings with KoldLok® products provide a cost-effective airflow and thermal management solution. Earcons offers the following advantages.